Though they look relatively simple in construction, garage doors actually have many components, especially if they’re hooked up to an electric opener. 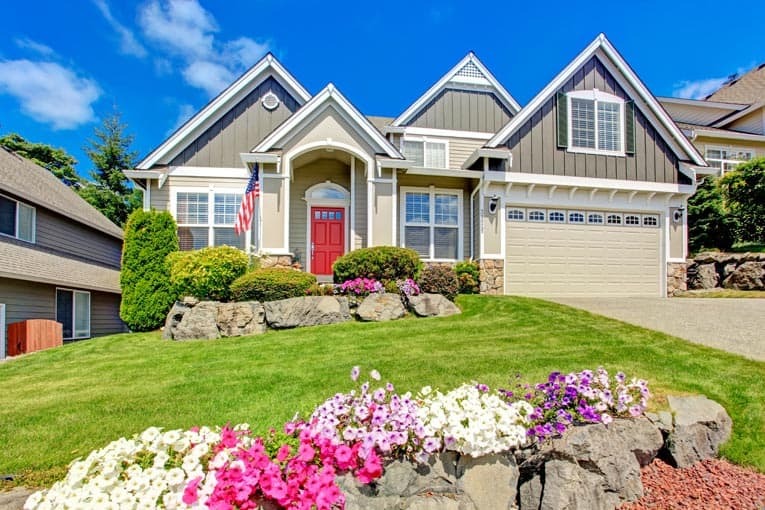 Because of this level of complexity—and the fact that a garage door must stand up against harsh weather—a garage door may suffer from any of several problems. Many of the necessary repairs are jobs that you may be able to handle yourself. 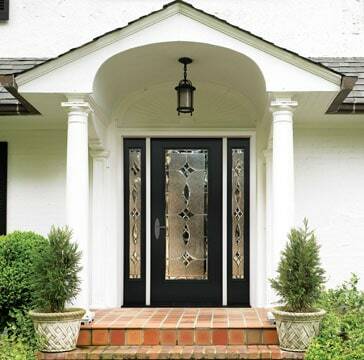 The most common problem is that the door becomes difficult to lift and lower. This may be something that can be resolved with a few simple adjustments and basic maintenance, or it may be more serious. If the door is connected to an electric opener, the first clue is to disconnect the opener mechanism from the door by pulling the release cord or lever. If the door works fine manually, the problem is with the electric opener; in this case, consult your owner’s manual or call a garage door opener repair pro. A door that seems unusually heavy to lift may have a problem with spring tension. Garage door springs are under extreme tension because of the loads they must lift, and this makes them dangerous to adjust. If your door’s springs are out of adjustment, do not attempt to work on them yourself. Call a qualified garage door contractor. Problems with a garage door lock can usually be traced to a poorly aligned lock bar. Fixing this is often just a simple matter of loosening a couple of screws, realigning the mechanism, and then tightening the screws. Because a garage door is a very large, heavy, moving part, it’s prone to fall out of adjustment with daily use. When this happens, the door becomes harder and harder to lift and lower. 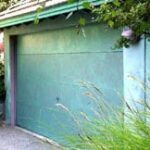 The best way to prevent a garage door from growing obstinate is to inspect it every year for loose or worn hinges, springs, and other hardware and, when you notice a problem, to address it immediately before it has a chance to worsen. Oil rollers & hinges at least once a year. Use hammer and block to adjust track alignment. The first line of defense is to lubricate the moving parts. As shown below left, apply penetrating oil to all rollers and hinges at least once a year. If you notice any loose screws, bolts, or nuts, tighten them so parts won’t fall out of adjustment. To prevent binding, tracks must be properly aligned to guide the rollers. If one or both of the tracks needs adjustment, loosen its mounting bolt and use a hammer and a wood block to persuade it into the proper direction, as shown at right. Then retighten the bolt. If the garage door opener needs adjustment, please see How to Adjust a Garage Door Opener. 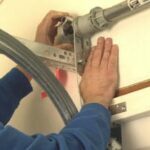 If you have a swing-up, one-piece door that sags in the middle when it’s in the raised position, you may be able to solve the problem by having a garage door contractor install metal reinforcing strips or rods across the inner face of the door. Then again, it may be time to replace the door with a roll-up door.